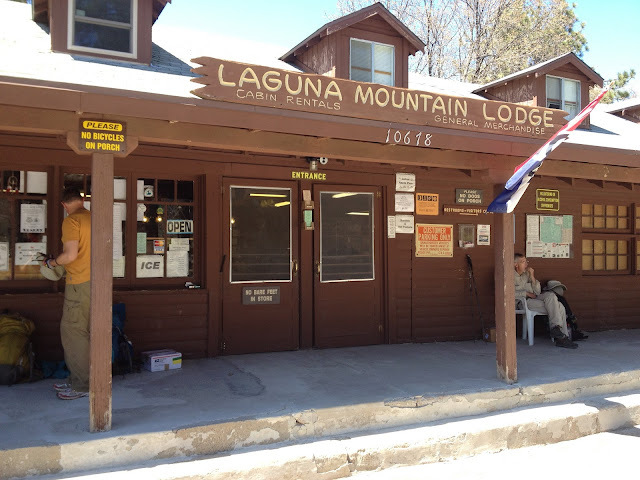 Cibbets Campground (Mile 33) to Laguna Mountain Lodge (Mile 43). Today we hiked up higher out of the blooming chaparral above 5000 ft elevation & into the Jeffery pines, cedars, and leafless blooming black oaks. Always like coming home when we enter piney woods. The fragrance of the Jeffery pines in the sun was remarkable. Chris said it was like butterscotch. Chris and Seano as we got up into the pines. Oooooooh, so fragrant and cool. We keep bumping into other thru-hikers who are either NOBO (northbound) and others who are SOBO. The latter are on their way to the big gathering of thru's & former thru's, section hikers, & trail angels (all things PCT) at Lake Morena on the 26-29 of this month -- the ADZPCTKO. Many of the NOBOs are going to catch rides back, as we are. We are meeting interesting and engaging (& accomplished) hikers of all ages and walks of life. But maybe we actually for this time all have "walk of life" in common. And maybe we always shall. We are finding the trail to be the walk of life that matters. 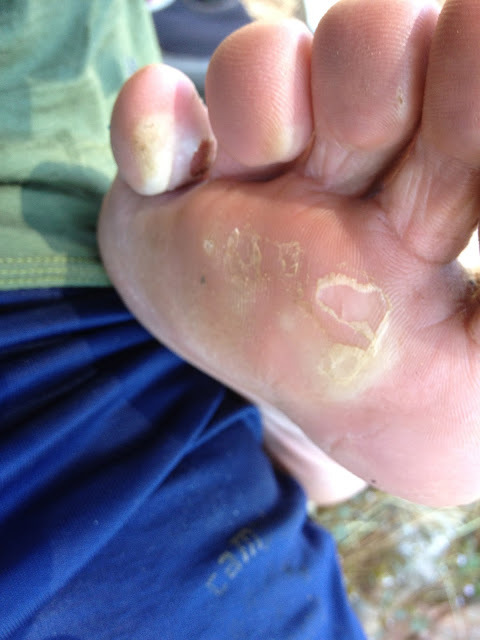 After 10 miles and topping out at 6000 ft my blisters became unmanageable. Chris & Sean overruled me and insisted I take a Nero (near zero) day. So they rented a cabin we could stay in. Chris became surgeon general working on my feet while Sean pulled laundry duty. For lunch Sean & I split a locally made peach & apple pie and a pint each of ice cream. Chris had a combo of other yummies. Tomorrow we have to make up for lost time. Wishing the three of you well on your journey. I am looking forward to following your travels via this blog.